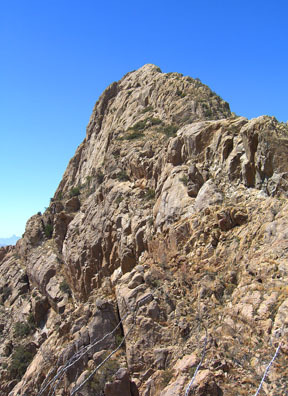 This craggy crest thrusts its head west of the better-known Mount Hopkins and Mount Wrightson in southern Arizona’s Santa Rita Mountains. The summit seems suspended, and it’s as if the range is reluctant to relinquish itself to the desert. You can see the peak from certain vantages in western Tucson, and from Interstate 19 south of Tucson. The peak is easier than it looks and makes a jocular day trip from the surrounding city. Gerry and Jennifer took the above photos on 3/29/06. 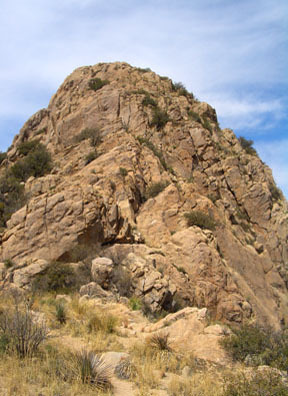 This is the easiest route on Elephant Head. 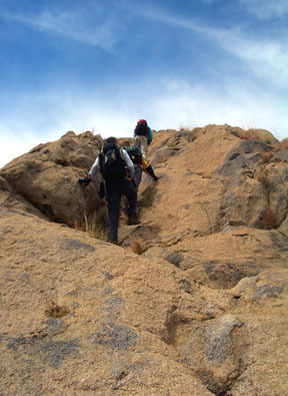 It is a modest approach hike followed by a jocular scamper up solid rock. 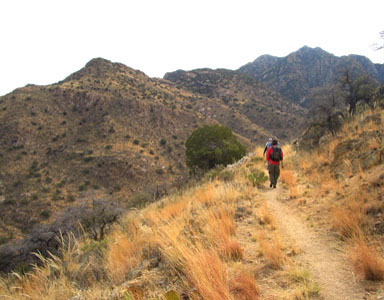 Start at the 4,580-foot Agua Caliente Trailhead east of Interstate 19 in southern Arizona. The start of Forest Trail 930 is 100 yards west of (before) the parking area on the north side of the road. 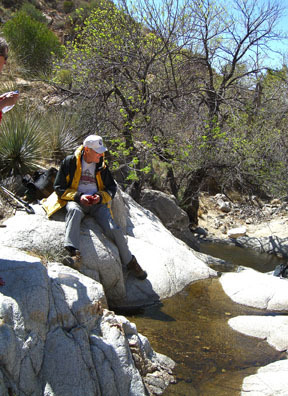 Follow FT 930 northwest, cross the Agua Caliente stream bed, then go 0.5 mile northwest on the trail to a saddle at 4,700 feet. 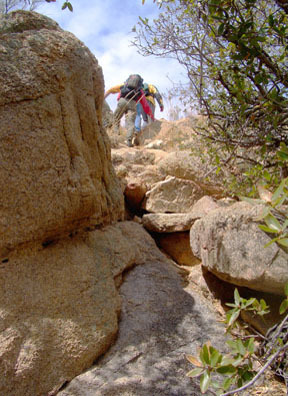 Cross the saddle, go 0.3 mile northeast, descend slightly, and join another trail coming up from the west at 4,520 feet. 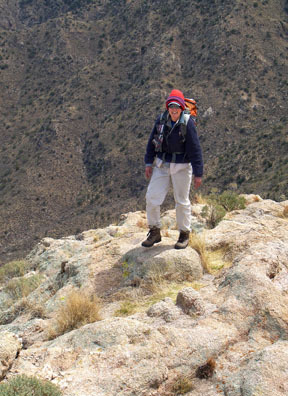 Go 0.9 mile generally north across Chino Basin and turn east into Chino Canyon at 5,000 feet. At this point, you have an unobstructed view of Elephant Head to the north across Chino Canyon. 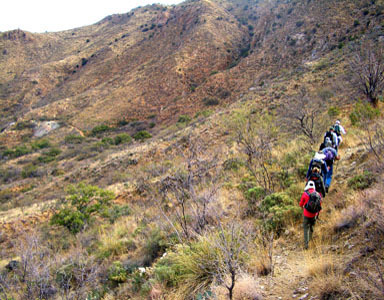 Your next task is to find the use trail that goes across Chino Canyon. A hundred yards east of the turn into Chino Canyon, look sharp for the use trail heading down to the northeast. 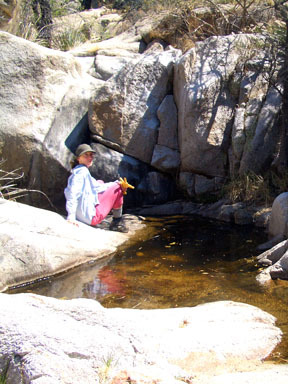 Leave the comfort of the main trail, and descend north steeply on the use trail for 0.2 mile down to the stream bed in Chino Canyon at 4,560 feet where there is a nice spring and pool. Cross the stream bed, and continue up to the north on the use trail for 0.4 mile to the east ridge of Elephant Head at 5,080 feet. Your 2.3 mile trail approach is over. Now for the summit scamper! 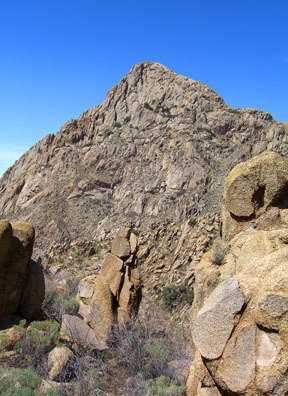 From the east ridge, you have a good view of the rocky upper peak, which is separated into two sections. The route is easier than it looks. 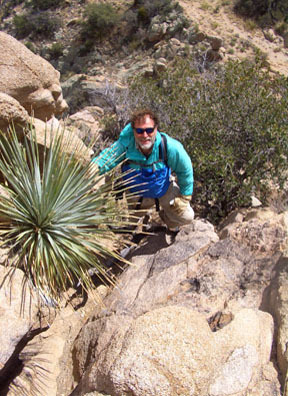 Hike 300 yards west up the ridge to the base of some initial, low-angle slabs. Scamper up these Class 2+ slabs following obvious weaknesses, then wiggle through some nifty passages between trees and rock to reach a bench at 5,260 feet. From here, you have an unobstructed view of the remaining, upper east ridge. Again, the route is easier than it looks. 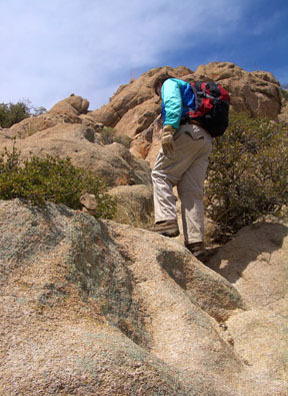 Go west across a small saddle, then scamper up the upper rocks following the path of least resistence. There is a use trail through the intermitent bushes. If you find yourself making Class 4 or 5 climbing moves, you are off route. Take your time to find the Class 2+ scampering passage. 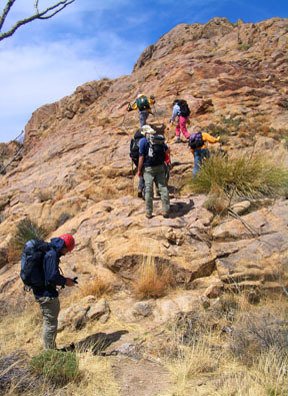 The difficulty eases as you approach the summit. 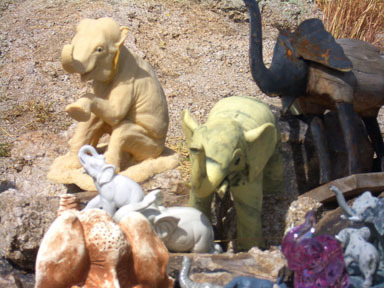 There is a surprise waiting on top, and of course, it involves Elephants! Enjoy.